Every now and again opportunities surface to do things that are out of the ordinary. One such opportunity appeared not long ago when we crossed paths with French Ship SURCOUF. Many of our NATO allies still practice “light line transfers”, to pass small items between ships in a pouch attached to a line. The practice originated so ships could pass correspondence and messages at sea, and while it’s not used much any longer, the French Navy still must practice the procedure for proficiency. So, they invited RUSSELL to give it a go and we accepted. RUSSELL’s key task was to maintain a very steady course and speed while SURCOUF approached from astern. On our signal, SURCOUF positioned herself off our wake at a safe distance for a short time to get a feel for the range of speeds needed to hold position close enough to pass a line. Next, she signaled her approach and increased speed slightly to slowly close the distance. Once in place, she slowed to maintain station and readied for the transfer. Russell’s gunners initiated the transfer by firing a shot line over SURCOUF’s bow. Their line handlers quickly passed the shot line to the forecastle and bent it to the light line. RUSSELL’s flight deck crew then hauled the shot line in, pulling the light line with it. In no time, the pouch was in hand and the Rig Captain unpacked the cargo of baguettes and bleu and Camembert cheese. After refilling the bag with some American specialties, RUSSELL gave the signal and SURCOUF hauled in their line. Once it was safely on deck the French ship signaled the completion of the task by hauling out to starboard. In all it was a great training opportunity for RUSSELL and the cheese was good, too! Hey long time no post, eh? Sounds cool, with the light line transfer... Baguettes, with bleu and Camembert cheese. That's so cool! :) Keep up the posting! Out of curiosity, what American specialties did we pass along to the French crew, exactly? How fast can it go in reverse? Well done to the crew on this practice exercise. 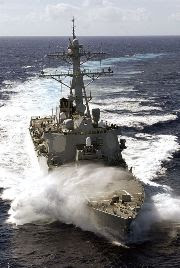 The French ship was fortunate to have the USS Russell for support. I continue to be amazed and impressed with the protocols you observe. Thanks from all of us at home! I would have gone into "stores" and provided them with a can of Spam relabeled as the Italian specialty "Spamutto."